The number of people killed or injured in drink drive crashes in Britain has risen by 7%, according to the latest official statistics, while the number of fatal crashes where at least one driver or rider was over the limit also rose. According to Reported road casualties in Great Britain: Estimates for accidents involving illegal alcohol levels: 2016, published by the Department for Transport (DfT), an estimated 9,040 people were killed or injured in drink-drive ‘accidents’- a rise of 7% from 8,470 in 2015, and the highest number since 2012. Final estimates for 2016 show that between 220 and 250 people were killed in crashes in Great Britain where at least one driver or rider was over the drink-drive limit, with a central estimate of 230 deaths. DfT officials said that while this figure is higher than in 2015, the rise is not statistically significant and the estimate ‘is continuing a period of stability recorded since 2010’. However, there were an estimated 220 fatal drink-drive crashes during the year, an increase from 170 in 2015 which officials said is statistically significant, ‘reverting to similar levels to those recorded between 2010 and 2014’. The total number of accidents where at least one driver or rider was over the alcohol limit rose by 6% to 6,070 in 2016. 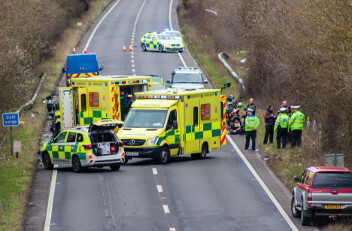 Road safety charity Brake described the UK’s current drink-driving law as lacking clarity and badly understood, and called for the Government to implement ‘an effective zero tolerance drink-drive limit’ of 20mg per 100ml of blood. Director of campaigns Joshua Harris said: ‘How many more lives must be needlessly lost before the Government acts on drink-driving? Today’s figures show that drink-driving is an increasing blight on British roads and yet the Government sits on its hands and refuses to address the issue.